3 service operates between 137 St/148 St and New Lots Av, making 4 stops in Brooklyn. 2 trains make all 3 stops between 135 St and Franklin Av – free shuttle buses operate between 148 St and 135 St, stopping at 145 St.
No 4 trains between Bowling Green and New Lots Av. Downtown 4 trains skip 116, 110, 103, 96, 77, 68 and 51 streets. No 5 trains between 149 St-Grand Concourse and Dyre Avenue – 2 trains and free shuttle buses provide alternate service. 5 service operates every 20 minutes between 149 St-Grand Concourse and Bowling Green. Brooklyn Bridge-bound 6 trains run express from Parkchester to Hunts Point Av and skip 116, 110, 103, 96, 77, 68 and 51 streets. 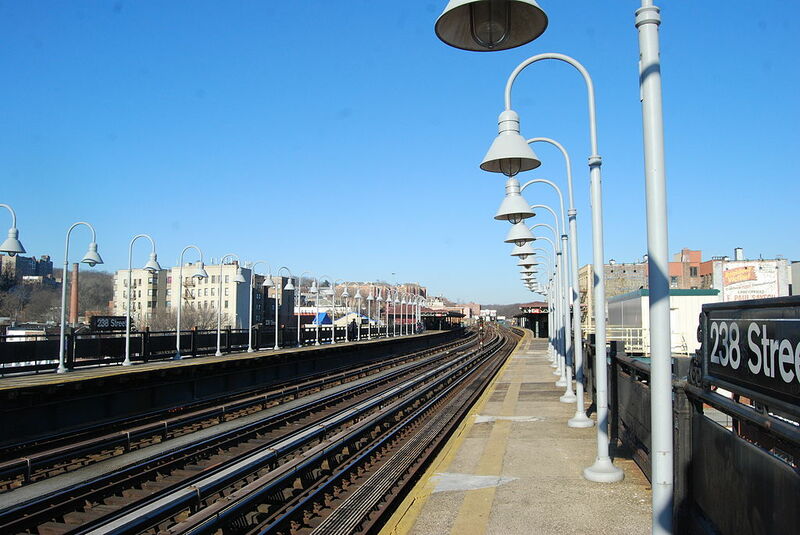 Inwood-bound A trains skip Spring St, 23 St and 50 St. Ozone Park/Far Rockaway-bound A trains skip 155 St and 135 St. Lefferts Blvd Shuttle runs between Lefferts Blvd and Rockaway Blvd. Ozone Park/Far Rockaway-bound A trains run via the F from W 4 St to Jay St-MetroTech. 168 St-bound C trains skip Spring St, 23 St and 50 St. Euclid Av-bound C trains run via the F from W 4 St to Jay St-MetroTech. Jamaica Center-bound E trains skip Spring St and 23 St.
D trains operate in two sections: from 205 St to 34 St-Herald Sq and from Atlantic Av-Barclays Ctr to Stillwell Av. D trains run express in both directions between Atlantic Av-Barclays Ctr and 36 St – buses operate between W 4 St and Grand St. Coney Island-bound D trains skip 170, 161 and 155 streets. M trains run between Metropolitan Av and Myrtle Av (Broadway). N trains run via the D in both directions between Stillwell Av and 36 St – free shuttle buses provide alternate service. Astoria-bound N trains skip 49 St. Queens-bound N trains run via the R from Atlantic Av-Barclays Ctr to Canal St. Free shuttle buses replace N trains between Queensboro Plaza and Ditmars Blvd. Forest Hills-bound R trains skip 49 St.
J trains run between Jamaica Center and Hewes St – buses run between Hewes St and Essex St, stopping at Marcy Av. No G service between Bedford-Nostrand Avs and Court Square – free shuttle buses provide alternate service.